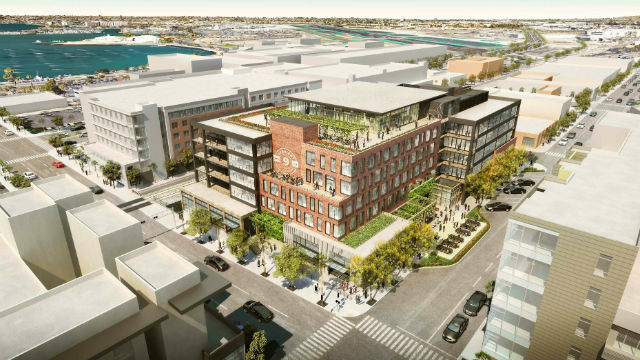 Kilroy Realty announced plans Monday to build a six-story, carbon-neutral office building on a full-block site in the Little Italy neighborhood of downtown San Diego. The 2100 Kettner building, designed by Gensler Architects, will have green roof areas, a solar array, an all-electric core, and efficient water, heating and cooling systems to reduce carbon emissions. Los Angeles-based Kilroy, which is also building One Paseo in Carmel Valley, said it is committed to sustainability to improve tenant satisfaction, reduce operating costs and make the building more resilient to future environmental and energy changes. The site at 2100-2174 Kettner Boulevard was acquired for $19.4 million from several families who had owned the property for nearly a century. The project will consist of 209,000 feet of flexible office space, six street-level restaurant or retail areas, 267 parking spaces and a 10,688-square-foot rooftop deck. When the office building is completed in 2021, it will be the largest structure in Little Italy.